ExIm – Easily export and import your data easily across Shopify stores. My primary objective is designing awesome eCommerce themes. I started about ten years ago with osCommerce. I have created themes for various eCommerce platforms like OpenCart, CS-Cart, Magento, PrestaShop, 3dcart, BigCommerce and of course Shopify. As for me, Shopify is the best eCommerce software for front-end developer. Firstly, Shopify has ThemeKit and Slate tools which make the development process very easy. Just like HTML/CSS/JS projects. Second, is Shopify’s platform. It provides a simple and powerful engine with the ability to extend its functionality. API for app developers, JS libs for front-end developers, new feature front-end API and GraphQL. Shopify has been adding new features based on DOM elements via JS. They are amazing and super flexible. However, some disadvantages do exist. If you want to create exact same store for testing or to install the same demo data on a client’s store, there is no easy solution. You should copy and paste multiple objects from one store to another. It’s very annoying and a time consuming task. You can spend hours to replicate a store. To simplify these tasks I create ExIm export/import Shopify app. 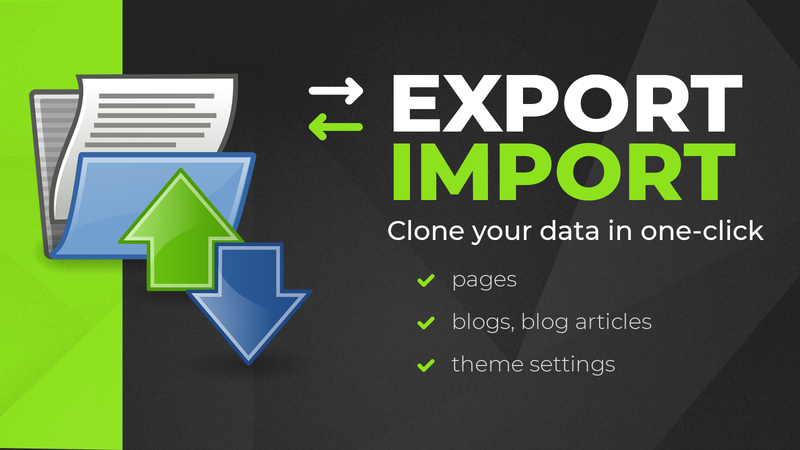 It includes an export /import feature for pages, blogs, and theme settings. Now I can simply export data from my demo stores and provide it to my customers. Customers may simply change from one pre-build theme config to another, in just a few clicks. Another bonus is that ExIm is a free app. No one-time payments, no trial period, no limitations, it’s free for life. Please enjoy my app and feel free to send me any feedback. Trial vs Developer Shopify store. Which to choose? When you what to start and an run online business, Shopify software is a good option. How do you start a Shopify store? The most popular way – sign up for a trial account. You can find more info about Shopify trial accounts here – Free trial. It’s a great opportunity to test out the Shopify software, become familiar with the admin interface, learn how to add and manage products, create collections, explore the navigation, and sort through different themes and apps. The main disadvantage is that the trial period is limited to 14 days. If this is your first Shopify store you may need more time to learn the Shopify admin, test everything, improve your theme or to find the needed app. Want to extend the Shopify store trial period? The next solution will answer this question. Another way to start a Shopify store – find a Shopify expert or Shopify partner. Ask them to create a developer store for you. As for MPIthemes, we are a Shopify partner and can create as many developer stores as you need. With a Shopify development store, you do have to perform one more additional step, (Find a Shopify partner to start a development store for you), but you get an unlimited trial period for your Shopify store. It’s up to you on what suites you best.